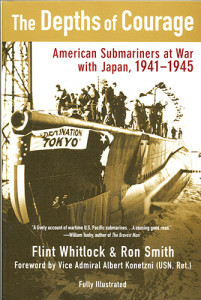 “The DEPTHS Of COURAGE” American Submariners at War with Japan, 1941-1945. By Flint Whitlock and Ron Smith. Foreword by Vice Admiral Albert Konetzni, USN (Ret.). In the dark days after the Japanese struck Pearl Harbor, the small, ill-equipped arm of the United States navy known as the Submarine Force would stand between the shattered American Pacific Fleet and the might of the Imperial Japanese navy. Unfortunately, the spirit and courage of the World War II Submarine Force is being slowly forgotten as the veteran of that small force pass silently into history. To preserve their heroic tales of the Pacific war beneath the sea, critically acclaimed author and military historian Flint Whitlock, in collaboration with decorated World War II submarine veteran and author of “Torpedoman,” Ron Smith. The two set out on a journey of more than two years to interview submarine veterans and to record their accounts before the memories were lost forever. As told by Ron Smith, and fellow submarine veteran the late Clay Decker and many, many others who fought in the “silent service.” With vivid action and haunting clarity, and fully illustrated with countless photos from World War II. This book will transport you back in time to experience the sights and smells of life onboard an American World War II submarine. New Softbound book. 428 pages, a whopping 77 black and white photos, 17 maps, 1 diagram and an index. Flint Whitlock served as a officer in the Vietnam War. He has appeared on several national radio and television programs, including the History Channel and Fox’s “War Stories with Oliver North.” Whitlock is the author of “Given Up for Dead: America GIs in the Nazi Concentration Camp at Berga.” Mr. Whitlock currently lives in Denver, Colorado. Ron Smith enlisted in the U.S. Navy in 1942 at the age of seventeen, taking part in five war patrols aboard the USS Seal (SS-183). He was an active member of the “U.S. Submarine Veterans of World War II” and “U.S. Submarine Veterans Inc.” Smith wrote the book, “Torpedoman.” While living in Austin, Texas, Ron Smith passed away on September 12, 2008.